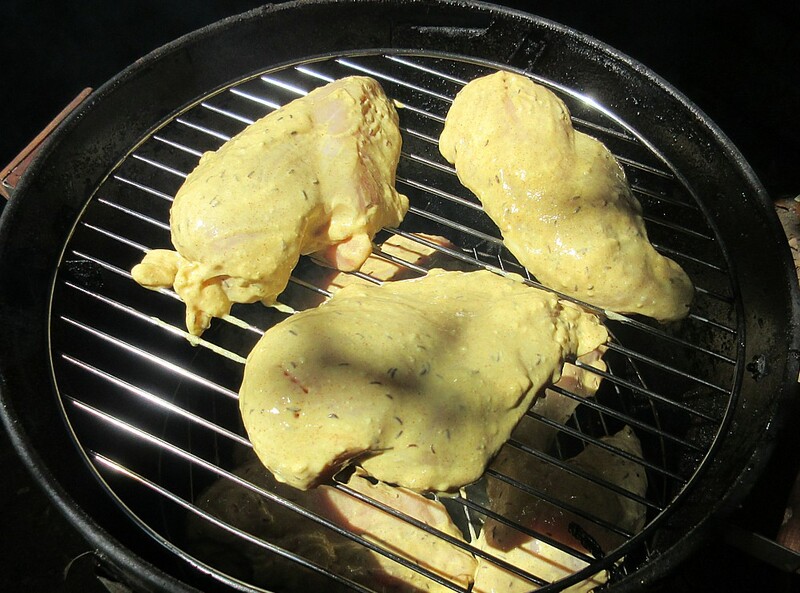 As usual the Mrs was watching the sales circulars and found boneless skinless chicken breasts on sale for $1.49/lb. 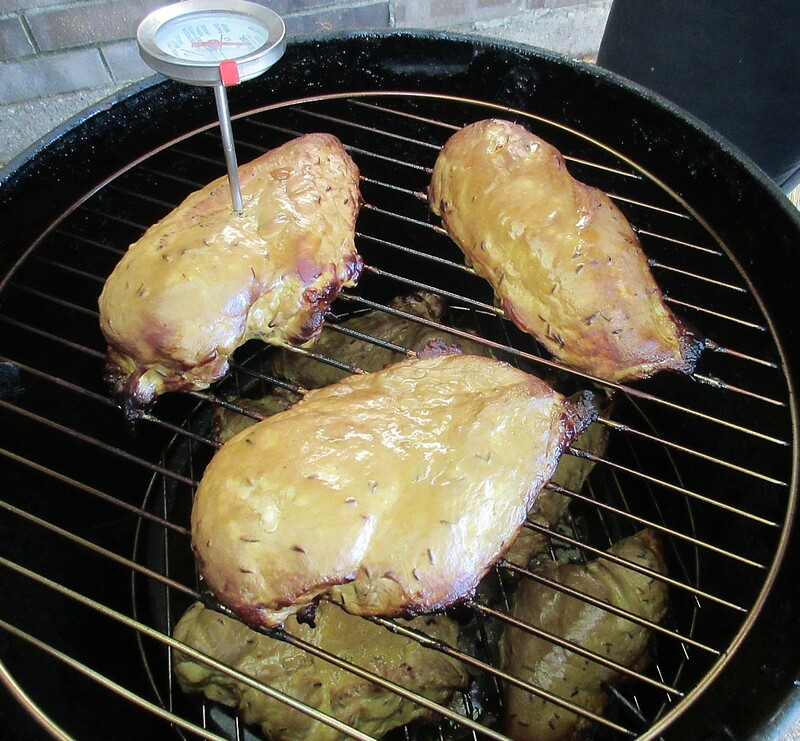 We used her secret marinade overnight, then onto our little bullet smoker for a couple of hours over charcoal and pecan wood from our yard. After 2 hours we slathered on some sauce and let them smoke another 20 minutes. The photo above is the finished product. 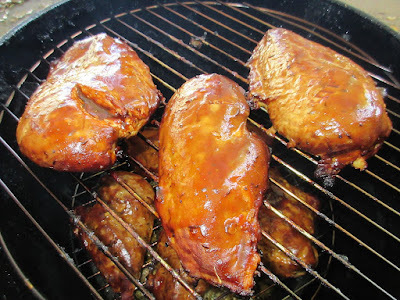 The meat was moist and tender with plenty of smoke flavor. 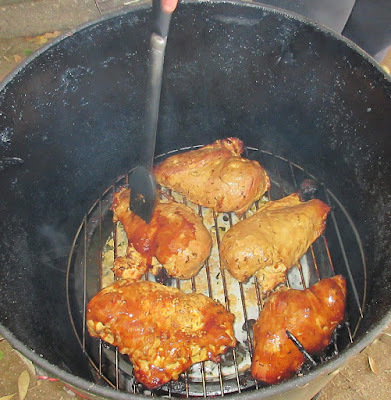 This back yard chicken is as good as any I have had at a restaurant and we have 8 pounds to munch on over the next few days. Below are a few more pics of the process. Chicks with marinade go into the smoker. This is what we had after 2 hours. Adding some sauce to the lower rack. That extra long brush is very convenient. 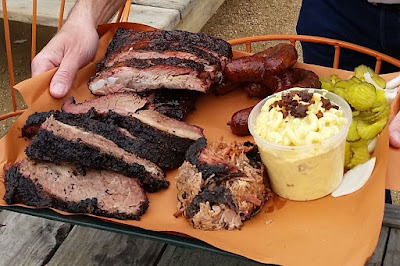 My buddy John took his family over to Pecan Lodge today and they sent me this photo of the Pecan Lodge trough. Don't click on the photo for the full view. It will make you hungry. 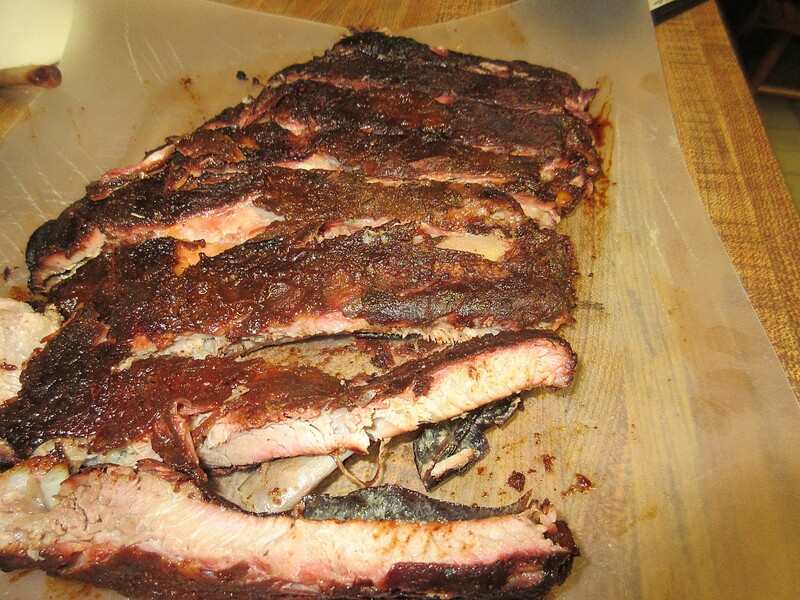 Ribs were on sale this weekend for $1.49 a pound and that was too good a deal to pass up. 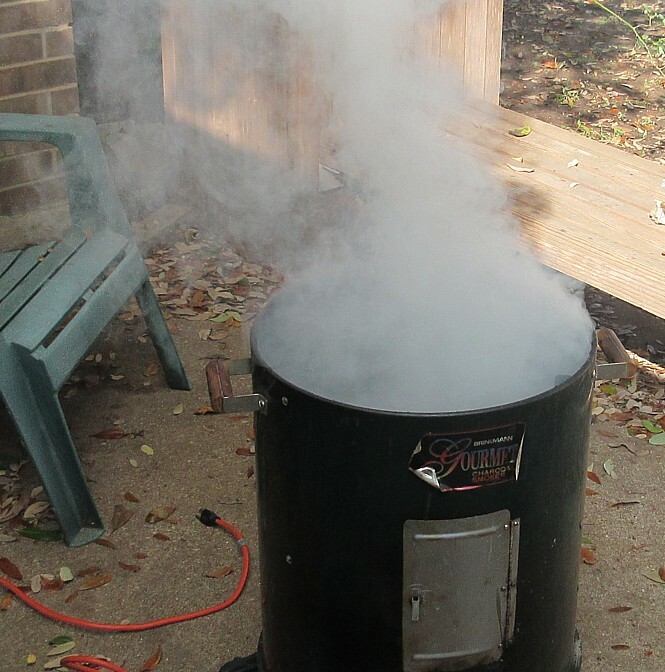 We also wanted to try our new "wood" smoke using pecan hulls. My Mrs has been putting aside pecan shells since last fall and as you can see above, they make a dynamite smoke generator. We prepped 2 racks as usual, but had to cut both racks down a bit as they were too long for our little bullet smoker. Soy sauce and some Obiecue seasoning made up the rub. 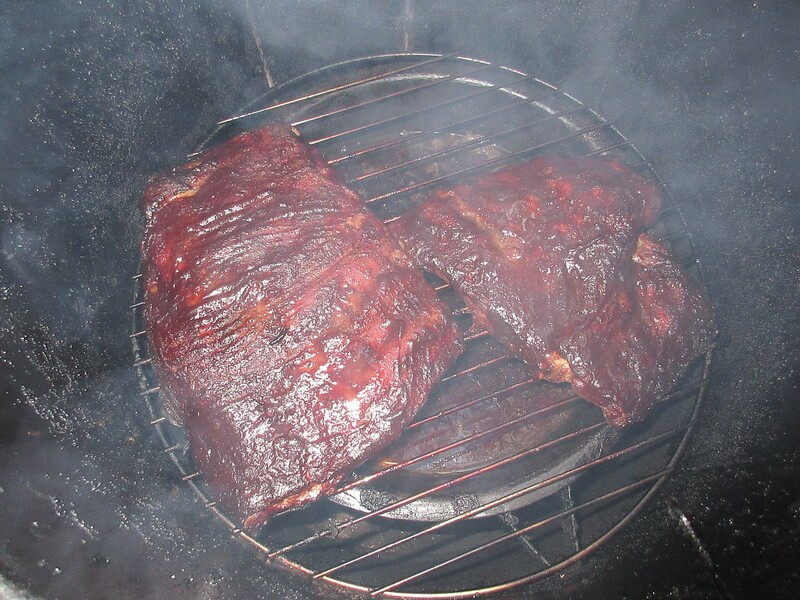 After 2 hours in the smoker we had the lovely sight above, times two. We sauced them up with some Dr Pepper BBQ sauce, gave them another 30 minutes on the smoker, then wrapped them up tight in foil. 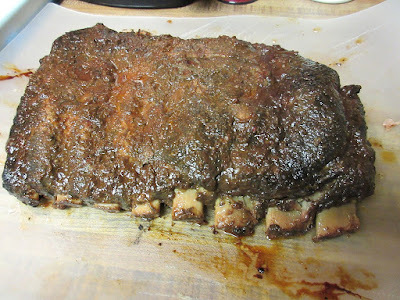 The wrapped ribs went back in the smoker for two hours, then we let them rest for about 30 minutes while still loosely wrapped in foil. Then we sliced them up and had a feast. The smoke flavor was awesome throughout but the meat was just a little bit tougher than I like it. I think next time we'll finish the heating in the oven where we can control the temperature better. The pecan hulls did a nice job adding some smooth smoke flavor so I think we will be saving those shells up from now on. 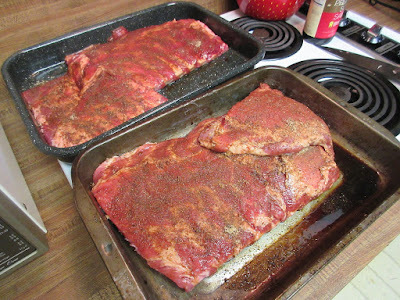 We're going to have to try them with a brisket, soon, maybe with a mix of oak and hickory.